OTEC News has a post on a potential Ocean Thermal energy project in Guam, which is claimed to cost $1.5 billion - Guam OTEC. 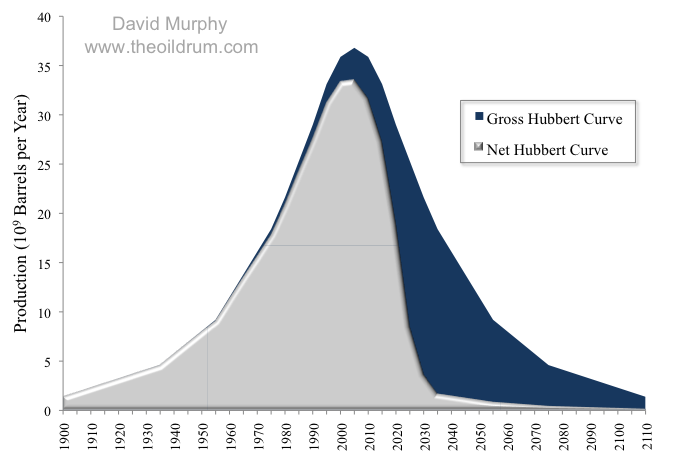 David Murphy has a post at TOD with a good graphic showing the effect of declining EROEI on a Hubbert curve (the "Net Hubbert Curve") = The Net Hubbert Curve: What Does It Mean?. Business Green reports that Microsoft is about to launch a power usage meter of its own as it tries to compete with Google on another front - Microsoft to bring energy savings Hohm. Microsoft is moving into the energy use-recording business, with a new application designed to tell consumers how much electricity they are using. Microsoft Hohm uses technology licensed from the Lawrence Berkeley National Laboratory and the Department of Energy. The free online application, which has not yet been made officially available, will take data from consumers where available and use it to help them assess their energy use. Such data will include house features, electricity usage patterns and appliances. Where the information is unavailable, it will use local and national averages. The system will use this data to make practical recommendations to consumers, including placing new caulking on windows or installing a programmable thermostat, said the company in a statement. The system is designed to integrate with energy meters so that it can gather data from customers transparently. To this end, the software giant is working with four utilities: Xcel Energy, Puget Sound Energy, Seattle City Light and Sacramento Municipal Utility District. It will create a software development kit for utilities to work with. Significantly, the software giant says that Hohm will use the Microsoft advertising platform, indicating that there may be a commercial element to the system. 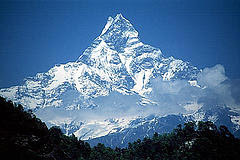 It will also take advantage of its recently launched Bing search engine. The move comes just weeks after Google announced its own set of partnerships around a similar system, called Google Power Meter. It, too, is publishing a set of APIs designed to enable utilities to look into its own systems, feeding data back to its servers, and enabling consumers to monitor their own power use. New Scientist has an article on an FAO report on the potential for agriculture in Africa - Africa alone could feed the world. DOOM-MONGERS have got it wrong - there is enough space in the world to produce the extra food needed to feed a growing population. And contrary to expectation, most of it can be grown in Africa, say two international reports published this week. The first, projecting 10 years into the future from last year's food crisis, which saw the price of food soar, says that there is plenty of unused, fertile land available to grow more crops. "Some 1.6 billion hectares could be added to the current 1.4 billion hectares of crop land [in the world], and over half of the additionally available land is found in Africa and Latin America," concludes the report, compiled by the Organization for Economic Cooperation and Development and the UN Food and Agriculture Organization (FAO). If further evidence were needed, it comes in a second report, launched jointly by the FAO and the World Bank. It concludes that 400 million hectares, straddling 25 African countries, are suitable for farming. Models for producing new crop land already exist in Thailand, where land originally deemed agriculturally unpromising, due to irrigation problems and infertile soil, has been transformed into a cornucopia by smallholder farmers. As in Thailand, future success will come by using agriculture to lift Africa's smallholder farmers out of poverty, aided by strong government measures to guarantee their rights to land, say both reports. Alex at WorldChanging has a post on setting up special zones to fast-track green building and urban design innovation - Special Innovation Zone: Imagination Without Regulation. Existence is the ultimate proof of the possible. Every time a bold new project is tried, and works, we advance our sense of the achievable. Given how much transformation we need in order to meet the challenges we face, we need many more attempts at innovation, and we're not getting them. The achievable is not advancing quickly enough. * Neighborhood opposition may slow down to the point of infeasibility any project which local NIMBYs think may bring "undesirable" people or activities, even if those activities are perfectly legal and may even be welcomed by other neighbors. Each of these examples is based on a story I've heard of an innovative project that died not because it was a bad idea, but because of societal inertia. Given how tough it is to start new projects (and find financing and support) under normal circumstances, innovators facing this kind of opposition often end up contenting themselves with incremental -- sometimes downright meaningless -- gains. This is not just a problem for the innovators, it's a problem for everyone. Breakthroughs in the way we make our biggest things -- buildings, vehicles, infrastructure systems -- need to go through a process of trial and error to reach the cutting edge. We may never know how many great ideas were lost forever, simply because the thinkers behind them couldn't find a place to experiment boldly and in public. What might that place look like? In many ways, the Global North is as hamstrung in the face of bright green challenges as China was in the face of capitalism. What if the answer is a sustainability and social innovation equivalent of China's answers: a sort of "Special Innovation Zone"? Imagine a place -- perhaps a shrinking city, or a badly savaged brownfield neighborhood -- where laws were set up to strip rules and regulations down to a do-no-harm minimum (maintaining criminal laws and protecting health, safety, workers' rights and civil liberties, but perhaps limiting liability and certainly slashing red tape and delays) allowing for wild deviations from existing patterns for buildings, systems and operations. Imagine a free-fire zone for sustainable innovations, where new approaches could be iterated and tested rapidly, and, when they work, sent to proliferate outside the Zone. Conversely, some of the freedom might paradoxically come from imposing boundary limitations that can't yet be made practical or survive politically outside the Zone, such as bans on broad classes of chemicals or strict greenhouse gas emissions limits. To be sure, there are places out there where people are already starting to experiment successfully with this blank-canvas mentality. Vancouver, B.C. has seen wonderful results in urban design from its discretionary zoning policy, which favors case-by-case evaluation of projects in pursuit of regional goals, rather than setting blanket standards. And in Greensburg, Kansas, the devastated landscape left behind after a tornado ripped through the town in May 2007 became a laboratory for innovation, as people from within the community and around the world resolved to rebuild Greensburg as a resilient, efficient and sustainable example of bright green living. Our allies at Re:Vision Dallas have offered up a full block in Texas's third largest city as the site for a new "sustainable model for the world." Although the final product will need approval at all levels, the design charrettes for Re:Vision Dallas put city officials and design visionaries in the same room, where they could tackle institutional stumbling blocks with more immediacy. If the winning designers have their say, the Re:Vision renovation will indeed push the envelope and the imagination. But these are small, limited exceptions that prove the rule. I imagine that anything actually set up to work this way would have a half-life that shortened the better the Zone got at producing innovation, either because it would fly apart (like so many brilliant artistic scenes) or because it would get so profitable that funding would pour in and crush the creativity (as happens to many unfettered intellectual booms). But while it lasted, a Zone like this might well spit out more proven innovation in a handful of years than gets built on the ground in decades during the normal course of things. It might well be a flare that could illuminate a whole series of interesting paths out of the darkness. As Iraq prepares to auction off oil contracts next week, the biggest of the Big Oil companies are keeping mum on whether they plan to bid. Exxon Mobil Corp. CEO Rex Tillerson said earlier this month his company was “still evaluating” whether to participate. Representatives for Chevron Corp. and ConocoPhillips said much the same in interviews this week. Other companies have complained privately that Iraq is offering only so-called “technical service contracts” rather than the production-sharing deals companies prefer. That means, in essence, that the companies would be serving as contractors, getting a fee for their work but not owning any of the oil they produce or the reserves left in the ground. Mr. Irani said the structure of the contracts doesn’t bother him. After all, he noted, owning reserves is no guarantee—look at Venezuela, where companies owned reserves until the government nationalized the oilfields two years ago. Not that Mr. Irani doesn’t see risks. The security situation in Iraq remains uncertain, he said, especially as U.S. armed forces pull back. The political situation is just as unstable. As a result, Mr. Irani said Occidental would prefer to get involved as part of a consortium rather than going it alone. Occidental is far smaller than Exxon and its ilk, and it specializes in the kind of projects Iraq is offering—rejuvenating old, neglected fields and developing previously discovered resources—rather than the exploration the supermajors do best. But most experts expect that, despite its complaining, Big Oil will fall in line and participate in next week’s auction. After all, at 115 billion barrels of proved reserves and plenty of territory left unexplored, Iraq is too big to ignore. Inhabitat has a post on the green building features at the new Virgin "Spaceport America" spaceport - Foster + Partners Break Ground on Virgin Galactic Spaceport. It’s an exciting time for space fanatics everywhere as construction recently began on the world’s first commercial space launch pad, Spaceport America. Designed by Foster + Partners, the facility is located in southern New Mexico near the White Sands Missile Range and will serve as a launch site for private space travel. Built into the side of a hill, the Spaceport will meet LEED building standards and includes some high-tech green building strategies including a solar roof, excellent use of thermal mass, and a highly efficient HVAC system. Virgin Galactic, part of the Virgin Group run by Richard Branson, commissioned the Spaceport from Foster + Partners, and has invested over $300 million to develop the new space launch system. Their plans are to have their first private space launch by 2011. 300 passengers have already signed up for their space flight and paid their $200,000 for the privilege. 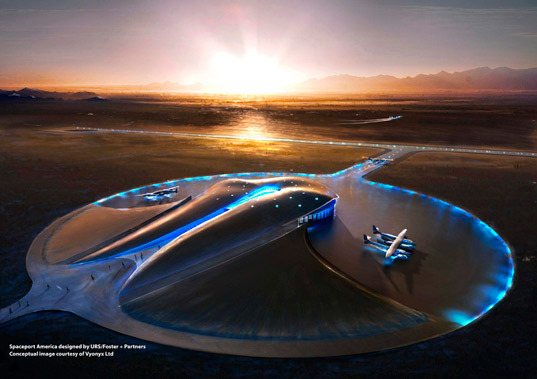 Additionally, when completed, Spaceport America will serve as the official venue for the X Prize competitions. Built into the side of a hill, the Spaceport will use the thermal mass of the surrounding earth to moderate the hot and cold desert temperatures. Earth-tubes will pre-condition air to reduce HVAC costs by 50-70% and solar thermal panels on the roof will heat water. The 110,000 square foot facility will also use skylights and natural ventilation to achieve greater energy efficiency. The Age has an article on the lack of support for solar thermal power in Australia - Dithering Australia leaves promising solar future in the dark. AUSTRALIAN support for the solar industry is faltering just as the technology promises to deliver baseload power. Recent breakthroughs in concentrating solar power technology allow heat energy to be stored almost indefinitely — in molten salts — and dispatched as needed. The Andasol parabolic trough solar thermal plant near Guadiz in Spain, developed and operated by German company Solar Millennium (which has an Australasian joint venture with Leighton Contractors), generates 50 megawatts (MW) of clean electricity, with enough storage to run for 7.5 hours without sun and around the clock in summer. There's plenty more coming, with Bloomberg reporting 14,000MW of solar thermal power stations are in the pipeline in Spain alone. That's enough clean power to run NSW, according to Matthew Wright, of Melbourne-based advocacy group Beyond Zero Emissions. In the US, SolarReserve and a division of giant defence contractor United Technologies plan a series of solar thermal "power towers" in the Californian desert — generating between 50MW and 300MW each — again using molten salts to store energy and able to run 15 hours without sun. Even better solar technology is being developed here, at the Australian National University, using super-heated ammonia to store energy. A company called Wizard Power is in a joint venture with ANU to commercialise the process. John Grimes, chief executive of the Australian New Zealand Solar Energy Society, fears a bitter replay of earlier brain drains. "Australian scientists and research and development are at the leading edge of the world," he says. "What we lack is government support to commercialise and capitalise on that research. We will be the dumb consumers of the technology that we invented." The Australian Government has shown this month that it is all over the place when it comes to solar energy policy. On a positive note, it surprised many when the May budget allocated $1.35 billion to part-fund construction of up to four solar power stations generating up to 1000MW each. But Grimes is concerned that, amid continuing uncertainty over the Government's renewable energy target (RET) and emissions trading scheme — and in the wake of the financial crisis — it will be difficult to raise the matching private capital needed to get those projects off the ground. Investor confidence would not be helped by the latest triple whammy of abrupt decisions. The popular $8000 means-tested solar rebate was unilaterally dumped by Environment Minister Peter Garrett on June 11, a fortnight ahead of schedule, leaving many suppliers, installers and home owners in the lurch. Technology Review has an article on "lightweight and energy dense" lithium-air batteries - Waterproof Lithium-Air Batteries. A company based in Berkeley, CA, is developing lightweight, high-energy batteries that can use the surrounding air as a cathode. PolyPlus is partnering with a manufacturing firm to develop single-use lithium metal-air batteries for the government, and it expects these batteries to be on the market within a few years. The company also has rechargeable lithium metal-air batteries in the early stages of development that could eventually power electric vehicles that can go for longer in between charges. Interest in lithium metal-air batteries has been growing in recent years, along with the demand for lighter power sources for devices ranging from plug-in hybrid vehicles to laptops. In lithium-ion batteries, the electrodes are made of materials such as graphite, while in a lithium-metal battery, the anode is made up entirely of lithium metal, and the surrounding air can act as the cathode. Lithium-metal batteries approach the energy density of fuel cells without the plumbing needed for these devices; in theory, the maximum energy density is more than 5,000 watt-hours per kilogram, or more than 10 times that of today's lithium-ion batteries. Lithium metal-air batteries are also very lightweight because it's not necessary to carry a second reactant. Lithium metal is "the holy-grail battery material," says Steven Visco, chief technical officer and founder of PolyPlus. IBM recently announced that it would develop lithium metal-air batteries for the energy grid and for transportation. "Lithium ion is the gold standard, but what can beat it is lithium metal," says Paul Beach, president of battery manufacturer Quallion of Sylmar, CA. Free Energy News reports that "After nearly three years of review, the jury selected by Steorn to validate their claim to a free energy device has issued a verdict: Steorn's process does not produce energy" (though the company remains convinced it will have a owrking product later this year) - Steorn Jury issues verdict: no excess energy. After nearly three years of review, the jury selected by Steorn to validate their claim to a free energy device has issued a verdict: Steorn's process does not produce energy. Despite the negative results of this jury, Steorn continues to allege that they will have such a product available to go into production by the end of this year. Members of the private forum who have been given information about some of the key ingredients seems optimistic as well. The negative ruling has not deterred McCarthy. In a response on their website, he pointed out that the Jury process had actually commenced at the end of 2008, and new developments through the beginning of 2009 have "resolved the key technical problems related to the implementation of Orbo." He said the company "is now focused on commercial launch towards the end of this year, at which time academic and engineering validation [will] be released concurrent with public demonstrations". The BBC has a report on the unveiling of a solar plane design that should be capable of a round-the-globe flight - Round-the-world solar plane debut. Swiss adventurer Bertrand Piccard has unveiled a prototype of the solar-powered plane he hopes eventually to fly around the world. The vehicle, spanning 61m but weighing just 1,500kg, will undergo trials to prove it can fly through the night. But Dr Piccard's Solar Impulse team has invested tremendous energy - and no little money - in trying to find what they believe is a breakthrough design. The HB-SIA has the look of a glider but is on the scale - in terms of its width - of a modern airliner. The aeroplane incorporates composite materials to keep it extremely light and uses super-efficient solar cells, batteries, motors and propellers to get it through the dark hours. Dr Piccard will begin testing with short runway flights in which the plane lifts just a few metres into the air. As confidence in the machine develops, the team will move to a day-night circle. This has never been done before in a piloted solar-powered plane. HB-SIA should be succeeded by HB-SIB. It is likely to be bigger, and will incorporate a pressurised capsule and better avionics. It is this vehicle which will attempt to circle the Earth (after first making an Atlantic crossing). It is probable that Dr Piccard will follow a route similar to the one he took in the record-breaking Breitling Orbiter 3 balloon - travelling at a low latitude in the Northern Hemisphere. The flight could go from the United Arab Emirates, to China, to Hawaii, across the southern US, southern Europe, and back to the UAE. Although the vehicle is expected to be capable of flying non-stop around the globe, Dr Piccard will in fact make five long hops, sharing flying duties with project partner Andre Borschberg. "The aeroplane could do it theoretically non-stop - but not the pilot," said Dr Piccard. "We should fly at roughly 25 knots and that would make it between 20 and 25 days to go around the world, which is too much for a pilot who has to steer the plane. "In a balloon you can sleep, because it stays in the air even if you sleep. We believe the maximum for one pilot is five days." FastCompany has a post on an unusual use of bioplastic - making raincoats - Biodegradable Spud Raincoat: Plant It in the Ground, Grow Trees. What if you could toss old items of clothing into the dirt in good conscience? You can--if you have Equilicuá's Spud Raincoat. The waterproof coat, made of potato starch-derived bioplastics, is entirely biodegradable and compostable. That means it can go into the ground at the end of its life. But the Spud Raincoat isn't just biodegradable. It also contains a small clay ball that houses seeds for Mediterranean herbs, flowers, bushes and trees using a Japanese technique called "Nendo Dango." The coat, a local product of Spain, sources its materials entirely from the European Union--it's produced in Spain with German bioplastics made out of French potatoes. The seed-housing balls are also made in Spain as part of a collaboration with the Más Árboles Foundation. Equilicuá doesn't reveal how long the $21 coat takes to degrade. So when will 100% biodegradable plastic become mainstream? It's hard to say, but plenty of companies are working on the technology. Frito-Lay, for example, is putting its SunChips line of multigrain chips in plant-based 100% compostable bags starting next year. Eventually, the company plans to use the compostable bags, which crumble into the dirt in 14 weeks, for all of its chips. While the PNG to Australia gas pipeline project failed because of all the coal seam gas that has been discovered onshore in Oz, the joint venturers in New Guinea are making progress on exporting the gas in the form of LNG to other destinations in the Asia Pacific region. the Australian reports - Oil Search, Exxon lead gas race with $2.5bn PNG deal. OIL Search and Exxon Mobil have cemented themselves as the frontrunners in the race for the region's next big gas export scheme after signing agreements to sell more than $US2 billion ($2.48bn) worth of liquefied natural gas a year from their PNG LNG project. The project, run by Exxon and expected to cost $US12bn to develop, will supply 4.3 million tonnes of LNG a year to three Asian customers at an undisclosed price. Japan's Tokyo Electric Power and Osaka Gas are two of the buyers, while the other is understood to be Taiwanese. Two million tonnes a year have already committed to China's state-owned Sinopec. The two deals now account for the whole 6.3 million tonnes of LNG a year expected from the project in 2013 or 2014. Sinopec, which has not been officially named as a buyer, is awaiting Chinese government approval. Exxon said it planned to sign binding deals by the end of the year. The deals announced yesterday are the latest in a flurry of contracts as several major plants, including the massive Gorgon project in Western Australia and coal-seam gas-to-LNG plants at Gladstone, head for an investment decision this year or early next year. The PNG LNG project, like CSG-to-LNG projects planned by Santos and BG Group at Gladstone, is targeting unmet LNG demand around 2014 as some big regional agreements end. 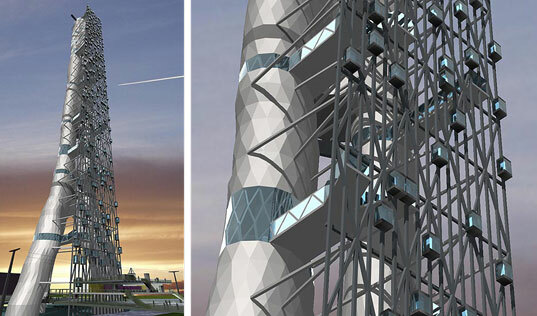 Green building of the week from Inhabitat is this tower planned for Rotterdam - Monolab’s Soaring Solar Rotterdam Tower. Monolab is aiming to take solar power to extreme heights by designing their sky-high Rotterdam Tower with a skin of photovoltaic panels. At 450 meters, the Rotterdam Tower design is intended to connect Europe’s largest port to the city by reaching into the vertical landscape. The tower, which has been designated as a mixed-use building, will incorporate public, commercial, and residential spaces. An intricate series of gondolas, which move up, down, and diagonally across the tower will leave passengers with a bit of vertigo while affording them an amazing view of the city. Rotterdam Tower is planned to be an extension of the port, and a new manmade connection back to land, thanks to the use of giant arms of steel. An integrated pedestrian boulevard will provide ample accessibility for those on foot. Those interested in getting to higher ground may view the city from the tower’s multiple sky lounges. A large parking structure with the capacity to hold 1000 cars is planned in hopes of liberating the downtown traffic zone and swapping asphalt for park grass. Bloomberg has a report on the debate over whether or not there is sufficient demand for Queensland's planned CSG to LNG plants in the medium term - LNG Demand Supports Australian Projects, Conoco Says . Global liquefied natural gas demand will prove strong enough to support development of proposed LNG projects in Australia’s Queensland state, a ConocoPhillips executive said. “Demand will be there going forward,” Ryan Lance, senior vice president for international exploration and production at the second-largest U.S. oil refiner, said in Darwin today. “LNG will be a fuel for the future” as pressure grows on countries to reduce emissions of harmful greenhouse gases, he said. Conoco’s venture with Origin Energy Ltd. is the biggest of the four most-advanced projects aiming to convert gas extracted from coal seams into LNG near the central Queensland city of Gladstone. The partners target the first exports in 2014. There are some 10 LNG projects in Australia and Papua New Guinea seeking to tap a forecast increase in demand in north Asia for cleaner fuels, even as the global recession temporarily curbs growth in energy use. LNG “supply is there, the demand is not there,” Fereidun Fesharaki, head of Honolulu-based consultant FACTS Global Energy, said at the Australian Petroleum Production and Exploration Association conference in Darwin. “Not all coal seam gas projects will go ahead,” he told reporters after the speech. China, the second-largest energy-consuming nation, is building more than 10 LNG terminals on its eastern coast to meet a government target of doubling the use of the cleaner-burning fuel. The Glasgow Sunday Herald has an article on a plan for a large tidal power project across Solway Firth, between Scotland and England - Tide runs in favour of new £500m Solway renewable power project. THE SOLWAY Firth is at the centre of £500 million proposals to build a mile-long dam between England and Scotland fitted with energy-generating turbines, the Sunday Herald can reveal. The proposed tidal barrage, subject of a £60,000-£100,000 feasibility study commissioned by Scottish Enterprise, the Nuclear Decommissioning Authority (NDA) and Northwest Regional Development Agency (NRDA), would stretch over the River Solway from Annan in Dumfries & Galloway to Bowness-on-Solway in Cumbria. Through a series of underwater turbines playing a similar role to those in hydroelectric dams, the projected barrage would be capable of producing up to 300MW of power - the equivalent of a medium-large wind farm. It is also being seen as a means of strengthening flood defences to prevent a recurrence of the 2005 Carlisle flood disaster, also as a rail and road crossing of the river, and potential tourist attraction: Nigel Catterson, chairman of Carlisle social enterprise company NB21C which is promoting the study, said: "North Cumbria and south west Scotland suffer in exactly the same way from being at the edge of regions. They are marginalised to a large extent and forgotten. We are suggesting that if we could come together as a gateway region at the centre of the UK we can start to create a new kind of impression around that." Allison MacColl, manager of the Scottish Enterprise industries team for the south region, said that the proposals originally date back to the 1960s. The plans were revived by local environmental groups in the wake of similar larger plans for the River Severn and recent research by Liverpool University into the tidal energy potential of rivers discharging into the eastern Irish Sea. The research found that the Solway was the most promising of the rivers in the region, and was the second most powerful tidal estuary in the country after the Severn. Scotland's Pentland Firth, described as "the Saudi Arabia of tidal power", is a strait, not an estuary. Technology Review reports that a Chinese-built electric sedan could be the first on sale in the US - A Startup's Electric Sedan May Be First on the Road. Coda Automotive, a startup based in Santa Monica, CA, is attempting to be one of the first companies to sell a highway-capable electric sedan to the general public in the United States. The car will have a range of 100 miles and will cost $45,000, although federal and state government incentives will bring the cost down to the mid-$30,000 range. However, the new company will quickly face competition from more established automakers for what analysts say will be a small market for electric vehicles--at least until prices come down. The car will be built by the Chinese automaker Hafei, which makes about 200,000 vehicles a year. The electric sedan is a version of one that Hafei already makes, but it's modified to use an electric motor and batteries instead of a gas engine. Coda is racing against several large and small automakers that are developing electric cars of their own and plan to start selling them to commercial and government customers for evaluation as soon as next year, with sales to the general public beginning in 2011 or 2012. Coda plans to distribute 300 evaluation vehicles in the summer of 2010 but will keep this test period short to beat others to market. It plans to start selling the sedan to the general public in the fall of 2010 and to deliver 2,700 cars that year. In addition to trying to bring the car to market ahead of its competition, Coda hopes to distinguish itself with its battery system, which it developed in cooperation with Tianjin Lishen, a major lithium-ion battery maker based in China, and other companies that specialize in different aspects of the battery system, such as the electronic controls. Kevin Czinger, Coda's president and CEO, says that the company jointly owns the factory that makes the battery packs, which will help Coda ensure a steady supply of batteries. This is also true for the Japanese automakers Toyota, Mitsubishi, and Nissan, but he says that his company is ramping up production for electric vehicles faster. By the end of the year, the company's battery factory will be able to produce 20,000 packs a year. "The scale and speed with which we're doing it are very different than the Japanese," Czinger says. "The ownership of mass manufacturing of the battery system distinguishes us from everybody else." Czinger says that if Coda can be the first to market with a popular mass-produced electric vehicle, it will sell enough cars to pave the way for a second-generation car that is less expensive and has a longer driving range. He says that the next car will be lighter and more aerodynamic, which, along with having improved battery technology, will make it possible to use fewer batteries while getting a 150-mile range. The Australian has an update on the fate of Iraq's oil, or as they put it, they Iraqi government (although not the parliament) is holding a "welcome-back party for Big Oil" - Shahristani plan to help rebuild war-ravaged economy. The government intends to auction off oil contracts to foreign companies for the first time since Iraq nationalised its oil industry more than three decades ago. If all goes according to plan in the first round, foreign oil companies will move in to help Iraq revive production at six developed fields that have suffered from years of war and neglect. But Iraq's fractious politics have complicated the process. Some lawmakers and oil officials have called for a delay of the auction. The man behind the plan, Oil Minister Hussain al-Shahristani, appeared before Parliament yesterday, where some lawmakers questioned the legality of the proposed contracts and what they called favourable terms for the foreign companies. But the auction appears to have sufficient political support to go ahead on schedule, and Mr Shahristani and other government officials vowed to plow ahead. Mr Shahristani's oil deals are crucial to this war-torn country's economy. Iraq is thought to have one of the world's largest supplies of crude oil, with 115 billion barrels in proven reserves. But foreign know-how is the key to its plans to boost oil output to four million barrels a day within four to five years, from 2.4m barrels now. Despite security risks, Western oil companies are clamoring to get in. Iraq is still relatively unexplored, offering big companies a potentially easy-to-tap source of growth. Some are touting Iraq as the most important opening of petroleum fields since the discovery in 2000 of the giant Kashagan field in the Caspian Sea. Some 120 companies have expressed interest in bidding for the contracts at the June 29 and 30 auction, according to the Oil Ministry. Thirty-five companies qualified to bid, including Exxon Mobil, Royal Dutch Shell, Italy's Eni, Russia's Lukoil and China Petroleum & Chemical, or Sinopec. The six oil fields at stake are believed to hold reserves of more than 43 billion barrels. Foreigners will not get the most prized piece of the action - ownership stakes in the reserves - but will be paid fees for ramping up output. Western oil companies were kicked out of Iraq in 1972, amid of a wave of nationalisation of Middle East petroleum. Oil production hit at least three million bpd before Iraq invaded Kuwait in 1990, then fell sharply to 300,000 barrels after economic sanctions and trade embargoes were imposed. Production rebounded to about 2.5 million barrels before the US invasion in 2003. Iraqi lawmakers have squabbled for years over a draft petroleum law that would set a legal framework for foreign companies to start drilling again. Tired of waiting, Mr Shahristani in 2008 unilaterally invited oil companies to bid on contracts. As global companies are reluctant to explore undeveloped fields in Iraq without an oil law, Mr Shahristani has focused on getting foreign help to pump from existing fields. More than a pure technology play, the venture sounds like it’s using the current lack of innovation and good design in the U.S. auto industry to offer a better-designed, more efficient American-made car. Throughout a promotional video founder and CEO Frank Varasano, who hails from Oracle and Booz Allen Hamilton, emphasized that V-Vehicle is “a new American car company;” Kleiner’s Ray Lane called it “a holistic change” from the current U.S. car industry. If the play is more about design and marketing than technology, we’ll see if the investors’ star power in the greentech world will help it actually sell cars in the consumer market (T. Boone has certainly made the crossover to mainstream quite nicely.) It may also help that the father of the Miata, Tom Matano, is leading the vehicle design team. T. Boone Pickens’ involvement is interesting, too, as the wind investor has largely been focusing on pushing natural gas vehicles. Part of his Pickens Plan is to replace a chunk of foreign oil consumption with domestic natural gas for transportation. If you look at the funds coming out of the stimulus package for new transportation (not much for natural gas vehicles) and new green car ventures being launched (I’ve heard of just a couple working on natural gas vehicles), you’ll start to see that natural gas vehicles aren’t really capturing investment dollars or mindshare from entrepreneurs. While V-Vehicle could be working on a natural gas vehicle, if it’s going to sell to mainstream consumers it probably isn’t. Perhaps a move by Pickens to back a more efficient vehicle that runs on gas (or even an electric vehicle) coincides with a move away from his natural gas vehicle mantra. Kleiner also has other auto-related startups, including electric sports car maker Fisker Automotive, a stealthy lithium-ion battery company, and reportedly also energy storage startup EEStor. But going after the mainstream U.S.-made car market is its biggest play in green cars to date. SmartMeters.com has an article on Google's investments in "ET" (energy technology) - Google developing smart charging software. Forward-thinking Google is researching potential problems that could arise when millions of people charge their cars at night. It will be years before plug-in hybrid vehicles dominate the roads but Google seeks to tackle the issue well ahead of time. Google is researching a number of smart grid technologies including the PowerMeter program that is currently undergoing tests with several utility companies in the U.S., one in Canada, and another in India. Google is working in the area where IT and “ET,” or energy technology, converge according to Dan Reicher, director of climate change and energy initiatives at Google.org. Reicher spoke at the Kema Utility of the Future conference held in Washington D.C. Reicher spoke about how Google is addressing concerns that millions of plug-in cars would overload the power system, or require the construction of new power plants, when they return home from work in the evenings. Google has developed software based upon what it calls a “vehicle dispatch algorithm” that determines the best way to charge multitudes of vehicles, according to Reicher. By “smart charging,” demand is levelled throughout the power grid. The technology also makes it easier to integrate renewable power sources despite their intermittent availability. The “vehicle dispatch algorithm” can also make operations easier for utility companies. Typically, power companies must rely on the generation source to increase or decrease the flow of electricity in order to maintain a steady frequency on transmission wires. According to Reicher, Google’s software allows plug-in vehicles to assume that role. Google is operating a fleet of plug-in cars at its corporate headquarters in Mountain View, California. The vehicles are serving as a proving ground for a number of smart grid technologies the search giant is researching such as allowing car batteries to feed back to the power grid during times of peak demand. Smart charging could become essential when millions of plug-in cars hit the roads over the next several years. Although they aren’t being widely produced as of yet, electric vehicles are expected to be released into the mainstream over the next year. Google is not the only company researching smart charging technology. GridPoint acquired V2Green in 2008 and has tested its version with General Motors’ Chevy Volt. GridPoint’s software is able to speed up or slow down the battery-charging rate and provides feedback to utility companies detailing the process. GM has said that it expects smart charging software to be available when the Volt is released to the market late next year. Working in conjunction with the automaker’s OnStar service, smart charging allows Volt owners to take advantage of the best electrical rates. Reicher also spoke about PowerMeter at the conference. He said Google will soon announce major deals with European utilities that will use the smart meter software. PowerMeter allows homeowners to monitor their energy usage in real time and displays information detailing how much energy power-hungry devices are using. The Australian's Green Chips column this week references almost the full gamut of large scale Australian clean energy proposals - central Australian geothermal power, Desertec's solar thermal power proposal, and Wilson Tuckey's tidal power plan for the Kimberly - Energy heavies back geothermal sources. ENERGY giants Origin and AGL have been busy beefing up their wind-farm portfolios in recent months in preparation for the upgraded Renewal Energy Target -- should it make its way through parliament. But perhaps the most revealing aspects of presentations both companies made last week was their faith in geothermal energy as a significant source of base-load power in the future. Wind power is expected to dominate the early years of the RET scheme, which will require that 20 per cent of Australia's power generation comes from renewable sources by 2020. But Origin told the UBS Energy and Utilities Conference that geothermal energy, developed at scale, could be a superior long-term solution to meet its RET targets, while AGL said geothermal would likely play a key role in base-load generation, even if some projects -- not its own -- faced significant transmission costs. Origin is a joint venture partner with Geodynamics, while AGL has a 10 per cent stake in another aspiring geothermal producer, Torrens Energy, and the right to take up to a 50 per cent stake in its project in exchange for funding. Geothermal producers believe they can have 2200MW of capacity generating power by 2020. The Australian Geothermal Energy Association and World Wide Fund for Nature say this would create 3800 full-time jobs by 2020. Their report said direct employment in the industry could more than double by 2030 and jump to more than 17,300 by 2050. Another report released last week by WWF, this time in conjunction with ocean energy producer Carnegie Corp, predicted a further 3200 jobs would be created if Carnegie met its goal of 1500MW of ocean energy capacity by 2020. However, both reports argued that for those technologies to meet their potential in the shortest period, the RET would need to be strengthened, possibly through banding, where extra credits are allocated to emerging technologies, direct assistance for drilling and an expansion of early development programs. THE timing of the long-awaited announcement on the demerger of CSR -- coming as the government plans to bring its new renewable energy target into force -- may not be entirely coincidental. One of the key concerns about splitting off a pure-play sugar business had been that it would be largely hostage to volatile commodity prices. But earnings are being stabilised -- partly through hedging, partly through high-margin refining for third parties, but also through its renewable energy businesses, which are emerging as the sugar division's biggest growth opportunity. CSR has been building up its biofuel and biomass energy operations in recent years. It is the second-largest producer of ethanol in the country and the largest generator of renewable energy from biomass. Last year, these two businesses accounted for about 30 per cent of the sugar division's $84 million earnings before interest and tax, and internal growth plans suggest they could account for more than half of earnings in the future, meaning it will have as much exposure to the price of fuel, electricity prices and renewable energy certificates as it will to raw sugar. Much will depend on the government's policies on biofuels and renewable energy. CSR will soon complete a near doubling of its ethanol capacity to 60 million litres a year. The ethanol -- made from molasses, a sugar bi-product -- produces less than half the CO2 emissions of petrol, and the feedstock does not affect food prices. The co-generation operation uses bagasse -- waste fibre from the cane crop -- to power the mills. But 100MW of the 175MW produced by the company is sold into the grid, and CSR sees the potential of adding 300MW of capacity in coming years -- with bagasse and cane trash. This will largely depend on the final structure of the RET, which is due to come into force from January 1, with CSR's demerger scheduled for the early part of next year. CSR Sugar now proudly pitches itself as a closed-cycle operation, one of the latest buzzwords for sustainable businesses: it grows and cuts and refines its own cane, using the molasses waste product as a feedstock for ethanol and the fibre for bio-energy. And it generates its own fertiliser, the Liquid One Shot, to inject back into the crops. THE search for clean energy solutions has sparked some big ideas, and one of the biggest is the Desertec concept: massive solar thermal generation capacity in the north African desert to meet up to 15 per cent of Europe's energy needs. Desertec was an idea of the Club of Rome think tank and the German Aerospace Centre, with an original goal of finding an alternative to importing Russian gas. Its bold vision to invest up to $US554billion ($682bn) in solar thermal has gained the support of insurance giant Munich Re, which is encouraging other firms such as Siemens, Deutsche Bank, and German utilities RWE and E.on to join a consortium. These and 15 other companies have agreed to meet on July 13 to discuss the project. Desertec is part of a grand plan to create a "super grid", linking this and other renewable sources in Europe, Middle East and Africa with super-efficient high voltage direct-current transmission lines. Desertec also has an Australian chapter, which envisages a similar super grid here, linking the solar and geothermal resources in Australia with Asia. It is not unlike a concept promoted by Tim Flannery, who spoke of the creation of "geothermia", an energy province that could use Australia's geothermal resources to support major emissions-free manufacturing, refining and processing industries. Maverick Liberal MP Wilson Tuckey has a major proposal of his own: investing $9bn to exploit the tidal energy resources of the northwest coast of Western Australia to generate energy to provide a more efficient, lower-emission source of energy that would support the establishment of an LNG processing industry, and even an aluminium industry in the north of the state. Jeff Vail has 2 new posts in his Renewables Hump / EROEI Hole series - The Renewables Hump 4: EROEI Issues and The Renewables Hump 5: Proxy EROEI Measurement. As discussed in the last post in this series, the energy return on energy invested in renewable sources of energy will be a critical measure of whether it is possible to transition on a large scale from a fossil-fuel powered economy, or whether a global "powerdown" is eventually inevitable. If EROEI, the net-energy ratio of a renewable energy source, is high--say 40:1--then it should be possible to rapidly transition our fossil-fuel driven economy to a renewable energy base, and to support ongoing economic growth that requires ever more energy. If this ratio, however, is low--say 4:1--then at a minimum a transition to renewable energy will be extremely challenging, and may be effectively impossible. As a result, the actual EROEI value of the various renewable energy options available to us is plainly critical. There are lots of measures, lots of studies, and lots of figures floated about for the EROEI value of solar photovoltaics, wind turbines, etc. There is not, however, a universally accepted methodology for calculating EROEI. In fact, I don't think it's a stretch to say that EROEI figures are more likely to be marketing copy intended to secure venture capital than the result of rigorous inquiry. In my opinion, understanding the reality of our society's ability to transition to a renewable energy basis for our economy is one of, if not THE most important issue to be resolved. If this transition is a realistic possibility, then it should be our society's primary and immediate focus. In addition, improving our understanding of just how realistic such a societal transition is will help us understand the necessary rate of investment in renewables, as well as the nature and degree of the challenges to be accomplished. If it is not realistic, then we must not waste what little surplus energy we have on a fools errand. In addition, the present understanding that such a transition is unrealistic will allow us to both develop and focus on those societal options that are realistic. Given the importance of accurate EROEI calculations, this post will discuss the current methodology issues with EROEI calculation and make recommendations for proceeding. There are two generally used methods for calculating EROEI: process-analysis and input-output analysis. Both basically boil down to a brute-force accounting of energy used in various component processes of producing a renewable energy source, with the key differences being how wide a net is cast in counting energy inputs. For example, is the diesel fuel required to deliver the turbine blades to the installation site accounted for? What about the energy required to build the truck, divided by the percentage of that truck's useful life used in that delivery? What about fraction of the energy required to build the machine tools used in the manufacture of that truck? This highlights the problem main problem with current system boundary calculations: you can regress these energy inputs infinitely far (e.g. what about the energy used to grow the rice eaten by the merchant marine captain who piloted the ship that delivered the metal ores used in manufacturing the bolts that hold together the turbine tower), and it's fundamentally impossible to use a brute-force accounting methodology to account for all energy inputs. If one hopes to use such a brute force approach (as used in both process-analysis and input-output analysis methods of EROEI calculation), then one must draw an artificial boundary for what is counted, and what is not. Is it acceptable to artificially constrain the accounted system? Clearly any artificial system boundary results in an artificially high EROEI, but how artificially high? Does this long-tail of non-accounted-for system inputs make the resulting EROEI figure 1% too high? 10%? 100%? 10 times too high? It's easy to dismiss, but how do we know if we are completely ignoring these long-tail energy inputs? I think there's great cause for concern that our EROEI is significantly over-estimated. For example, in a paper by Prof. Cutler Cleveland and others, the EROEI of wind-power is assessed by looking at over 100 separate EROEI studies. These studies are broken down into process-analysis and input-output methodologies. Prof. Cleveland notes that process-analysis generally draws a tighter system boundary than input-output analysis--that is, it counts fewer inputs. In that survey, the process-analysis EROEI measurements for wind average 24:1, and the input-output measurements average 12:1. That's a 100% difference based on where the artificial system boundary is drawn. In light of that significant difference, how can we be sure that a truly inclusive system boundary wouldn't result in a further 100% (or more) decrease in the measured EROEI? The take-away here is that we simply can't trust the accuracy of currently available EROEI calculations. Further, it seems unreasonable to place any credence in any brute-force (e.g process-analysis or input-output analysis) approach to EROEI calculation. How can we get around the accounting difficulties and arrive at an accurate EROEI calculation--a calculation that can do more than just provide a comparison between renewables, and can actually provide a self-contained assessment of whether a given technology can facilitate a societal energy-transition? Odum has proposed what he calls an "Emergy" measurement that intends to account for a true EROEI measurement. However, while Odum recognizes the importance of an inclusive calculation, Odum's methodology does nothing to address these accounting issues, and the end result is still a brute-force estimate that suffers from the same methodological failings as traditional EROEI calculations (even if it tends to arrive at lower EROEI figures). Rather than a brute-force approach that literally attempts to count all the energy inputs, I think it will be necessary to use a proxy to calculate "true" EROEI. One methodology that I've proposed for this task is to use price as a proxy for EROEI. I'll discuss briefly the theory of how this would work, as well as the clear problems with this approach. It always struck me as fishy that various EROEI claims (especially for wind) result in an energy payback time of less than a year. In other words, these figures suggest that it would only take a few months to pay back all the energy required to build a wind turbine, and then that wind turbine would go on generating electricity for decades more. Why, then, didn't we already transition the vast majority of our energy base to wind if it's so efficient? The answer is that the financial payback isn't nearly so rosy. What accounts for the difference between the rapid energy payback (only months) and the much longer financial payback (often an order of magnitude or more longer)? Intuitively, it seems that at least part of the answer is that the EROEI wasn't accounting for many inputs that were counted in the financial analysis. For example, the financial analysis accounted for the high salaries--derivatives of the long years of training--that must be paid to the engineers, the financiers, the technicians, the managers, the materials scientists, etc. that are involved in the production of a wind turbine. These long years of education certainly represent an energy input, but aren't accounted for in either process-analysis or input-output analysis EROEI calculations. Similarly, the cost of raw materials represents, at least in theory, the full spectrum of energy, machinery, personnel, and support systems needed to extract, refine, transport, and market it--a great deal of which lies outside the traditional artificial system boundaries drawn in traditional EROEI calculations. It seemed to me that the financial cost of a renewable was a better proxy for the energy inputs to that renewable than were any of the accepted EROEI calculation methodologies. This is the core of what I've called "price-estimated EROEI," which uses financial cost as a proxy for energy cost. The basic calculation assumes that the entire cost of a renewable is made up--eventually, if one regresses far enough--by energy, so divides that cost by an average energy cost to arrive at the energy input, and then compares that as a ratio to the amount of energy the renewable will produce over its lifetime. Not surprisingly, this form of calculation tends to produce a far lower EROEI than any of the accepted EROEI methodologies. Of course, there are acknowledged flaws with this price-estimated EROEI methodology. Just to name a few, it's difficult to account for the differing values of the various types of input energies and the resulting output energy; there are market distortions, tax-incentive distortions, geopolitical distortions, etc. That said, I think this type of proxy calculation at least directly addresses the need to calculate a truly inclusive EROEI, and may well be much closer to the "truth" of the required energy inputs than any traditional methodology. In the next two post I'll address two other potential methods for measuring "true" EROEI: asymptote location and worker-year calculation (as suggested by Neil Howes). Then, I'll look at the EROEI of wind power and solar power from both traditional and proxy methods of calculation. WorldChanging has a post on promoting renewable energy in the developing world - ICLEI's Emani Kumar explains Urban Energy Innovation in the Global South. It's been a while since most cities took an active role in managing their own energy supply. Centralized national or regional generation and supply grids effectively displaced the days when cities ran their own independent systems. But with the interest in local renewables a shift is in the works. Cities are becoming increasingly comfortable integrating energy policies into their mandates and encouraging local level generation. The many facets of this shift have been a key theme at the ICLEI World Congress, running in Edmonton (Alberta) until the end of the week. Through programs like the Cities for Climate Protection (CCP), and the Local Renewables Network, ICLEI has helped foster renewable power projects in many cities that have already been celebrated for their energy accomplishments. German solar cities like Freiburg, or Vaxjo Sweden (acclaimed the greenest city in Europe) are all attending the Congress here in Edmonton. But a draft report released at the conference by REN21, the Institute for Sustainable Energy Policies and ICLEI makes it clear that those cities are not alone. The “Global Status Report on Local Renewable Energy Policies” points to 160 other cities who have put in place local renewable energy policies and programs. Among the most interesting are cities outside of the areas normally celebrated in the media for leadership on these issue. In India, for example, a small group of cities have been pushing for the adoption of local renewables, and their work has paved the way for a national Solar Cities Project announced earlier this year. One of those leaders is Nagpur, India. A city of 2.4 million, Nagpur has put in place a municipal ordinance requiring solar hot water heaters on all large new residential buildings. In a different take on using property taxes to create incentives, the municipality has created a 10 percent tax rebate for homeowners who comply. Nagpur is also aiming for a 20 percent reduction in conventional energy consumption by municipal buildings and services by 2012. The interest is more than local. The recently announced national Solar Cities Project builds on the work done by Nagpur, and other Indian cities that are part of ICLEI's Local Renewables Network. In the first phase of the project 60 cities (Nagpur among them) have committed to meeting 10 percent of their energy consumption through energy efficiency measures and renewables over the next 5 years. The national program provides cities with major financing to enable them to plan and implement a local energy strategy. I spoke with Kumar about the initial hurdles of the Local Renewables Program in India and his hopes for the future of the Solar Cities Program. Queensland set to become solar powerbase ? The Brisbane Times reports the Queensland State government is talking about building a reasonably large solar thermal power plant in northern Queensland, with a less than ambitious timetable of 2020 - Queensland set to become solar powerbase. An oversight by the State Government may jeopardise its plans to develop a source of clean, green, solar energy with the potential to power up to 400,000 Queensland homes. The Bligh Government today flagged its commitment to building state's first baseload solar thermal power plant by 2020. However, part of the State Government's Renewable Energy Plan, released today by Premier Anna Bligh, fails to qualify for funding under the Commonwealth's $465 Renewables Australia Fund. The State Government has set aside $6 million to explore the possibilities of solar thermal and geothermal "hot rock" energy, neither of which are supported by the national renewable energy scheme. Should new Renewable Energy Target legislation pass through Federal Parliament, all electricity providers will be made to source up to 20 per cent of their electricity from renewable energy sources. Solar thermal and geothermal "hot rock" resources are the two key alternatives capable of providing Queensland with baseload electricity on-demand, World Wildlife Fund Climate Change Policy Manager Kellie Caught said. "The State Government needs to convince the Federal Government that they need to segment some of those renewable energy targets, perhaps five per cent, specifically for solar thermal and geothermal energy sources," Ms Caught said. The Federal Government's proposed scheme will only support wind, biomass, solar panel and solar hot water energy systems. "At the moment there won't be any room for solar thermal or geothermal energy," Ms Caught said. Hot fractured rock geothermal energy, discovered about three decades ago in the United States, taps into hot granite rock, nearly five kilometres below the earth's surface. Brisbane company Geodynamics has already developed a pilot geothermal plant under the Cooper Basin in north-west South Australia, proving it can recover enough steam from water pumped down wells to rocks heated to 300 degrees to power the town of Innamincka. The State Government, in partnership with the Clinton Foundation's Climate Change Initiative, will undertake a $1 million feasibility study for a large scale solar thermal plant. The Clinton Foundation is an organisation set-up by former US president Bill Clinton to focus on worldwide issues such as climate change. The state's five Solar PV (panel) stations collectively produce 0.815 megawatts of power, a proposed solar thermal station at Cloncurry would be capable of producing more than 10 times that amount. A "super plant" near the North Queensland coast could generate from 500 to 750 megawatts of electricity, the Clinton Foundation's Tony Wood said. Mr Wood said the study would look into the scale of the plant, the best location in terms of the sun and transmission lines, how much it will cost and whether it needs to be built over several locations or one. Renewable Energy World has an article on wind power potential in Europe - Wind Could Power Europe Many Times Over. A new report from the European Environment Agency has concluded that wind power's potential in 2020 is as much as three times greater than Europe's expected electricity demand, rising to a factor of up to seven times demand by 2030. This study confirms that wind energy can play a major role in achieving the European renewable energy targets and that the extent of wind energy resources in Europe is very considerable. The report, ‘Europe's onshore and offshore wind energy potential,' highlights that the wind energy potential is huge, equivalent to almost 20 times energy demand in 2020. Onshore wind energy potential is concentrated in agricultural and industrial areas of north-western Europe. Likewise, the largest offshore potential can be found in low depth areas in the North Sea, the Baltic Seas and the Atlantic Ocean, with some local opportunities in areas of the Mediterranean and Black Seas. The deep offshore potential is even larger but costs mean that it is unlikely to contribute in any significant way to the energy mix within the time horizon of the study. Using only 4 % of the offshore area within 10 km from the coast and accounting for the restrictions imposed by shipping lane, gas and oil platforms, military areas, reduces the potential by more than 90 % to 2800 TWh in 2020 and 3500 TWh in 2030. When production costs are compared to baseline average electricity generation costs, the onshore potential for wind decreases to 9600 TWh in 2020, whereas offshore wind potential decreases to 2600 TWh. Despite being a small proportion of the total technical potential, the economically competitive wind energy potential still amounts to more than three times projected demand in 2020. However, high penetration levels of wind power will require major changes to the grid system at higher penetration levels, with additional extensions or upgrades both for the transmission and the distribution grid possibly required to avoid congestion. The conclusions were welcomed by the European Wind Energy Association (EWEA), with CEO Christian Kjaer observing: “The EEA clearly recognizes that wind power will be key to Europe's energy future. Now that oil prices are again on the rise, the EEA report sends a reminder to Europe's policy makers that wind power is a clean and proven energy technology and Europe is the world leader." Reuters has a report on US oil reserves, which demonstrates how pointless such numbers are, given that the reserve number is effectively defined by the current market price for oil - US oil, gas reserve dropoff less than stated - study. U.S. oil and gas reserve additions were hit hard by low prices at the end of 2008, but accounting rules forced companies to overstate the real decline, Ernst & Young LLP executives said Thursday. Charles Swanson, managing partner of the accounting firm's Houston office, said reserve growth could recover quickly when the economy rebounds, boosting prices and improving the economics of discoveries that had to be taken off the books. "The physical hydrocarbons are there," Marcela Donadio, Americas director of oil and gas, said at a briefing on the firm's 2009 "benchmark study" of 40 companies' exploration and production performance. Accounting rules governing company reporting of reserves knocked proven but expensive-to-produce reserves off the books when oil prices plunged from $147 in mid-2008 to $40 at the end of the year, she said. New bookkeeping rules taking effect at the end of this year could change the picture significantly even if the economic recovery is slower than hoped, Donadio said. " Ernst & Young's study of 40 companies' performance showed their U.S. oil reserves fell 7 percent in 2008 to 15 billion barrels from 16.1 billion barrels in 2007 - not surprising amid talk of "peak oil" but still sobering, the executives said. The change reflected revisions knocking 1.2 billion barrels of oil reserves off the books because they were uneconomical to produce at $40 a barrel, Donadio said. 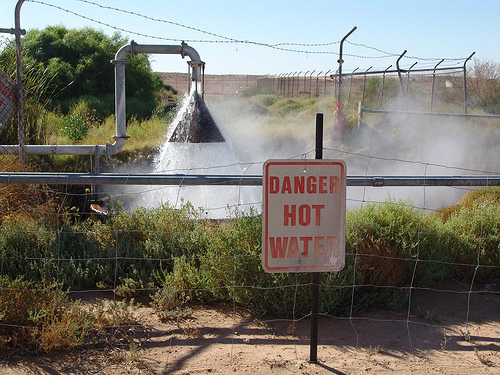 Australia.to has a report on an upgrade to the low temperature geothermal power plant at Birdsville in Queensland - Bligh invests up to $4.3 million in new geothermal power station for Birdsville. Birdsville's landmark geothermal power station will be upgraded to produce more clean energy for the remote south western Queensland community. Mines and Energy Minister Stephen Robertson said today the Bligh Government is investing up to $4.3 million to help replace ageing equipment at the Ergon Energy-owned and operated plant. The funding will provide a 50 per cent subsidy for the project which will invest in new, leading edge geothermal technology. The Birdsville power station was first commissioned in 1992 and remains Australia's only operational geothermal power station capable of electricity generation 24 hours a day. The energy source comes from hot water taken from the Great Artesian Basin at a depth of 1,280 metres. This hot bore water provides a 'free' energy resource, which would otherwise be wasted when water is cooled before use. The ABC reports the local mayor is very enthusiastic about the plant - More backing sought for outback geothermal power. he Diamantina Mayor says he would like to see more Government support for the geothermal sector, because he says it is the most sustainable power source. The Queensland Government has committed $9 million for a new geothermal plant to be built at Birdsville in the state's far west. Mayor Robbie Dare says a large portion of the town's electricity is already provided by geothermal sources, using water taken from the Great Artesian Basin. "It's been successfully running there for 20 years and it runs 24-hours-a-day, unlike wind or solar," he said. "It's so cheap. Fuel is one of the dearest commodities to run a generator right out here in the outback." "This just runs off the heat of the water, once it's up and running it's just virtually maintenance. It should be put in all over Australia. This new plant will almost run the town again, or will run the town again." Guy Rundle at Crikey has a post on the latest phantom menace to appear out of the twilight - the ELF are coming to destroy our power stations (well, maybe) - Who cooked up this ELF hobgoblin?. There ain’t nothing like a homegrown terror scare to get the juices flowing, and yesterday’s “Earth Liberation Front” extortion threat had everything you could ask for — shadowy groups, sinister warnings, police mobilisation. Even better it was locally produced and carbon neutral. The only trouble was it was ninety per cent recyclable male cow gardening product. To recap: it was revealed on Sunday that a letter had been delivered to the house of Hazelwood power station supremo Graeme York, purportedly from the Earth Liberation Front holding him responsible for the “dirtiest power station in Australia and the most polluting in the industrialised world”, and obliquely threatening damage against his personal property as a result. Scary stuff. Only trouble is the Earth Liberation Front doesn’t exist. Oh there is — or was — an organised group called the Earth Liberation Front. Several of them in fact, one founded in Brighton England in the early 1990s, another in Eugene Oregon a bit later, with others — some with variant names like the Canadian Earth Liberation Army — springing up in different “alt” cities such as Vancouver. The ELFs originated from the broader Earth First movement, a decentred green anarchist movement of the 1980s with a broad range of views about the limits of civil disobedience and direct action. Some believed that mild property damage — gluing-up locks, letting down tyres, etc — was the limit, others believed that a more forceful approach, up to and including arson of legit green targets, such as forestry equipment, skimobiles etc, was possible. It was this latter groups that became ELF, principally in the US Pacific Northwest. Yet the whole point of such anarchist groups is to be decentred, to have no proprietorial interest over who adopts the name. The idea that Melbourne ELF is being run from some biodegradable bunker beneath a mungbean café in Portland is a fantasy. Melbourne ELF is probably one share squat of 20-year-olds, currently scoping the media and watching with delight as a single printed out letter sends the entire energy-political complex into paroxysms of fear and loathing. Indeed, the fuss serves various parties — the police, who want a continuous state of low-level threat to justify increased resources, the politicians seeking to increasingly criminalise green protest around dirty energy, the energy companies who want the security for their private activity to be paid for by the taxpayer and put on a quasi-military footing — and a small number of anarchist groups who want to project power by using the strength of the establishment against itself. This is an old trick, called spectrality, after the beginning of Marx and Engels’s Communist Manifesto : “there is a spectre haunting Europe … the spectre of communism”. There wasn’t of course. There were a bunch of motley groups meeting in pubs across Europe. They gained power and prestige by convincing the authorities to rate them as a real threat to the established order, and thus threw their shadow across the continent. So well played Squat No.23, whoever you are — the authorities did everything that could be expected of them. Dear Graeme, As the Chief Executive Officer of Hazelwood power station, you are responsible for the dirtiest power station in Australia and the most polluting in the industrialised world. You are causing irreversible environmental destruction which will go on to harm not only those living on the planet today, but your children’s children too. We hold you personally accountable for this assault against our Earth. We do not take lightly to the perpetual destruction of our land-base for the selfish and short-term objective of fattening your bank account. We know that the disgusting Carlos Slim is collaborating with the state to spy on telephone conversations of different activists, that he is an accomplice of the government intercepting emails from different people who the authorities consider dangerous so that they will be arrested and even more to criminalize any struggle in Mexico; that is why Telmex is being fought through economic sabotage and this will continue. For that same reason we have easily sabotaged 30 phones; the actions are increasing. A revolutionary greeting to the eco-saboteurs. Without wanting to dob anyone in I would guess that Melbourne ELF is a pure hoax by people who haven’t taken on the “green anarchist life” to any degree. Alternatively, it may be an inside job. For months now, NSW and Victorian governments have been making loud noises about the increasing criminalisations of civil disobedience directed against power stations — upping the ante from criminal trespass and damage to specifically-tailored laws adding a premium of up to five years prison for disrupting energy supply. These laws could be applied even when “disrupting energy supply” consists merely of a sit-down protest in an energy company’s office foyer. In the US, several ELF activists have received 20-year sentences for crimes such as torching snowmobiles — the extra years on the sentence (which would usually be 5-10) because the acts are defined as “terrorist”, even though no greater damage is done, than other numerous attacks attributed to rural booze and high spirits. As Jeff Sparrow noted here on the assassination of Dr George Tiller, what gets defined as simple crime or something worse, is a purely political judgement. In that light, review state minister Peter Batchelor’s weird comment about seeing if “we didn’t need new laws to deal with this sort of thing”. Well, we already have these laws — it’s called “threats and menaces”. Convenient to have something like this appear just as the “energy security” debate hots up. Am I suggesting that Victorian government labs cooked up a secret pseudo-Melbourne ELF letter? I am emphatically not. I am suggesting it’s possible that someone from the Labor Right or associated swamplands is doing a freelance provocation — and the language of the letter suggests to me that they are inept at hiding their own background in the political mainstream. The Independent has a look at the side-effects of falling water levels in Iraq - As Iraq runs dry, a plague of snakes is unleashed. Swarms of snakes are attacking people and cattle in southern Iraq as the Euphrates and Tigris rivers dry up and the reptiles lose their natural habitat among the reed beds. "People are terrified and are leaving their homes," says Jabar Mustafa, a medical administrator, who works in a hospital in the southern province of Dhi Qar. "We knew these snakes before, but now they are coming in huge numbers. They are attacking buffalo and cattle as well as people." Doctors in the area say six people have been killed and 13 poisoned. In Chabaysh, a town on the Euphrates close to the southern marshland of Hawr al-Hammar, farmers have set up an overnight operations room to prevent the snakes attacking their cattle. 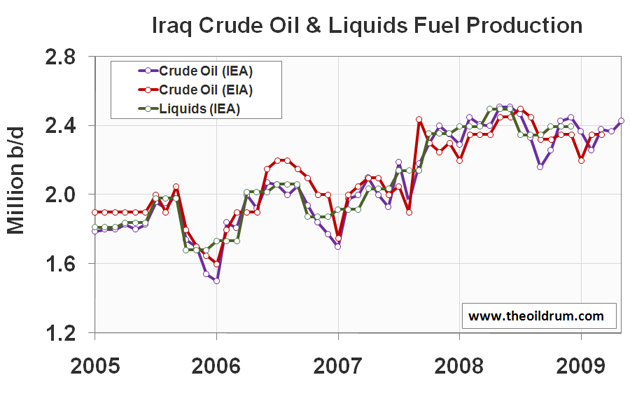 The latest "Oilwatch Monthly" also mentions Iraq, showing that Iraqi oil production continues to rise. Having shipped hundreds of electric vehicle charging stations, and with repeat orders now coming in from Europe, Coulomb Technologies, a privately-held Silicon Valley company, expects to be profitable by the 2010 introduction of the Chevy Volt, according to its chief executive, Richard Lowenthal. Founded in 2007, Coulomb is looking to crack the chicken-and-egg riddle that bedeviled the hydrogen fuel cell industry. Without a refueling infrastructure, consumers won’t buy vehicles. But no one invested in refueling stations without potential customers on the road. With electric vehicles, the additional problem is that in cities like San Francisco, where almost half of all vehicles park on the city’s streets, many potential buyers couldn’t recharge their cars overnight. Mr. Lowenthal, a Cisco veteran who served as mayor of Cupertino, said that municipalities, parking companies and condo developers represent the first tranche of customers for charge points that will be deployed on city streets and in garages. They sell for $2,500 to $4,000 and can recharge an electric vehicle battery in four to ten hours. In what might shape up to be the VHS/Betamax duel of the industry, a Coulomb rival, Better Place of Palo Alto, is looking to develop refueling stations where consumers on road trips can swap batteries in a matter of minutes. Still other companies are building rapid recharge points. Reuters reports that Munich Re is looking for backing from a group of German companies to build a "Deserts of Gold" style solar thermal power complex in North Africa - Munich Re touts Sahara in solar energy push. German reinsurer Munich Re (MUVGn.DE), facing billions of euros in claims for damage caused by climate change in coming years, is seeking to drum up support for an ambitious plan to build solar parks in the Sahara desert. The reinsurer wants backing from other leading European companies for a feasibility study on generating a significant proportion of Europe's power needs in northern Africa -- at a cost potentially running into hundreds of billions of euros. The project is the brainchild the Club of Rome, an association of social leaders who aim to foster sustainable development best known for its 1972 book 'Limits to Growth'. Munich Re has invited several companies, including Deutsche Bank (DBKGn.DE), Siemens (SIEGn.DE), E.ON (EONGn.DE) and RWE (RWEG.DE), to meet on July 13 to agree on a joint project, said a foundation organised by members of the Club of Rome. "We have approached Munich Re to get industrial companies on board and Munich Re organised the meeting with the other companies," said a spokesman for the Desertec foundation, which is fostering the idea to generate solar power in Africa. The 20 companies and Desertec aim to sign a memorandum of understanding to found the Desertec Industrial Initiative which would commission studies on possible projects, he said. A first power station with a capacity of 2 gigawatts in Tunisia with power lines to Italy would take five years to build once it gets regulatory approval, the spokesman said. A possible long-term project could be a 100 gigawatt solar thermal power station in northern Africa and the Middle East. It could be finalised by 2050 with power lines connecting it to central Europe and would cost an estimated 400 billion euros ($555.8 billion), he said. A solar power station with 100 gigawatt in western Europe -- where the sun shines for fewer hours and far less intensely than in the Sahara -- would be able to supply some 28 million homes, according to the German association of power generators. Inhabitat has a post on a new form factor for rooftop thin film solar - Researchers Unveil Flexible Solar Cell Roof Shingles. By far one of the most wasted spaces of every residence is the roof - of course it is there to protect us from the elements, but surely it can be put to better use. Aiming to innovate upon conventional roof cladding, researchers at the Pacific Northwest National Laboratory recently unveiled a new breed of flexible and moisture resistant solar panels that are designed to be rolled out en masse as energy-generating roof tiles! Solar Panels are a great source of green energy, but unfortunately they’re not the prettiest of things - massive solar arrays tend to stick out like sore thumbs. Traditional photovoltaic panels, such as those incorporated into building facades, also tend to be costly, and producing them in a cheap and usable quantity has been a common problem. Researchers at PNNL developed a film encapsulation process that was initially used for protecting flat panel displays over 15 years ago. However with the recent emphasis on energy generating technologies, they decided to take a second look at the materials and encapsulation process. It turns out that this encapsulation process can be used to protect components that are intended to be exposed to ultraviolet lights and natural elements, making it perfect for waterproofing thin-film solar panels. PNNL hopes to produce a solar panel that can be installed on a residence and generate power for a few cents on the dollar. Research is currently being undertaken in conjunction with Vitex and Batelle, and hopefully we’ll see a marketable product soon.